By combining observations from the Large Area Telescope and the Parkes Radio Telescope in Australia, scientists have found a new technique for hunting pulsars. The team has already found five new “millisecond” pulsars, including one particularly intriguing object, proving that the technique is successful. The Large Area Telescope (LAT), built by SLAC for the Fermi Gamma-ray Space Telescope, collects information on high-energy gamma rays from numerous sources in the sky. Among these are small, elusive objects called pulsars, which spin up to hundreds of times per second. Their name derives from the beams their magnetic fields produce as a result of this spin, which look like the pulsing beam of a lighthouse when, by chance, they happen to sweep across our field of view. 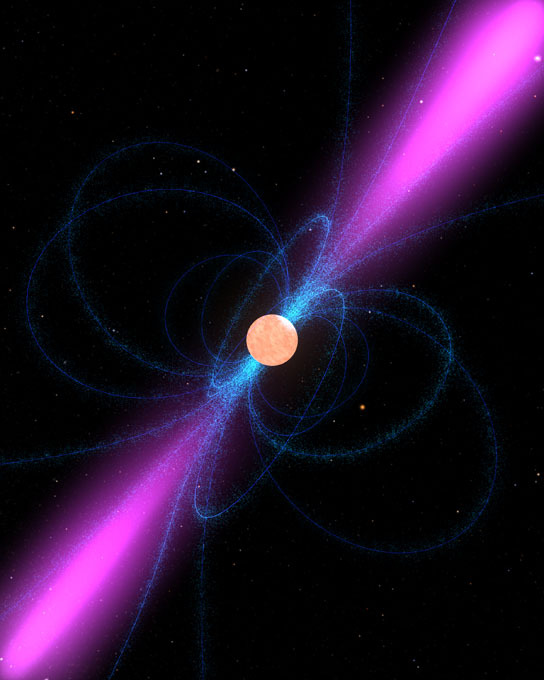 Pulsars are very interesting to scientists because they are special types of neutron stars. Small (about 10 miles in diameter) and dense (one teaspoon weighs about a billion tons), they exhibit immense gravitational and magnetic forces not found on Earth. The LAT has seen the gamma-ray signatures of more than 100 pulsars and is revolutionizing the study of these flashy objects in gamma rays, which are the most energetic form of light. A team led by postdoctoral researcher Matthew Kerr of the Kavli Institute for Particle Astrophysics and Cosmology (KIPAC), and Columbia University radio astronomer Fernando Camilo is reporting the use of new techniques for hunting pulsars. They and their colleagues have found a way to look for likely pulsar candidates by combining observations from the LAT and the Parkes radio telescope in Australia. This approach combines the broad reach of an all-sky telescope (the LAT) with the deep sensitivity of a radio telescope, which can view only a tiny part of the sky at a time. So far, the discovery of five more rapidly rotating, or “millisecond” pulsars, including one particularly intriguing object, prove that the technique is successful and likely to uncover many more pulsars in our galaxy. One especially interesting object discovered with this technique seems to have a previously unknown waveform – a gamma-ray peak before and after each radio peak – an effect the team could not explain using standard models of pulsar geometry. This suggests that the radio part of the beam may originate at two distinct points above the object’s surface. This variation increases the mystery and allure of these fascinating astrophysical phenomena. This work is described in part in a paper published in the Astrophysical Journal (ApJ, 2012, 748, 2), and based in part on a KIPAC Tidbit by Jack Singal. Be the first to comment on "New Technique Leads to the Discovery of 5 New Pulsars"